If your Digital balance or scale breaks we can fix it. When your scale needs calibrated, we can handle that promptly and efficiently with NIST traceable standards and documentation. 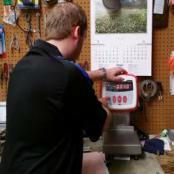 Thanks to the outstanding training that each scale technician receives from Central Carolina Scale you can be certain that your weighing equipment is being checked and tested by a factory trained specialist. Our technicians are continuously being trained throughout the year on various topics and new products through various learning methods such as hands on factory training, in person training with the factory representative, online webinars, on the job training, and training manuals. Some of the key hands-on training that we focus on is calibration, configuration, and serial interfacing of electronic components, from load cells and indicators to printers and peripherals. We also review mechanical scale basics, electronic basics, load cell theory and trimming, electrostatic discharge protection and power conditioning, digital weight indicators, load cell introduction, data collection and troubleshooting. Once these skills are mastered we then focus on learning a systematic and methodical approach to troubleshooting. We also focus on scale system connection, batching, interfacing, and data recording. Areas of emphasis include scale mechanics, load cells, indicators, power conditioning, data collection, and troubleshooting process control. We have quite a bit of experience with the Rice Lake indicators and the basic setup and configuration of the 720i™, 820i® and 920i® indicators using the front panel and software tools such as iRev, Revolution®. Working with a laptop computer, we look at things like use of setpoints and how to setup and use the iQUBE2® diagnostic junction box. Of course in today's automated industry world, we can not forget the skills to service mechanical scales. So some of our training also looks at things like pivots and bearings, levers, scale recognition, maintenance and repair, beams & portable beam scales, dial scales, motor truck scales, and electromechanical conversions. We appreciate your business and it is our goal to provide you with outstanding customer service and an efficient, knowledgeable technician who can fix your scales and get you back up and weighing. Central Carolina Scale can help you set up and maintain these important check ups on a regular basis, so that your scale service and calibration schedules are followed properly. Our technicians arrive prepared to provide these essential services, ensuring your scales are weighing accurately. Complete documentation will be provided, usually the same day. We believe that training and developing our employees is the best way for us to provide customers the experience they deserve. We are committed to training our scale repair and maintenance technicians at the highest level. Our training strategy includes subject areas such as: "hands on" training, also sometimes referred to on the job training with an experienced technician. Often, our more experienced technician will show new tech's how to do certain tasks and share the knowledge of experience to our new Technicians. Our focus area for this training is for technicians with limited experience or those that may be unfamiliar with certain product lines or weighing applications. Factory Training is important as well. We actually have numerous scale manufacturers that provide us with factory training both at our facility in Sanford as well as the scale factory. Rice Lake Weighing actually offers multiple classes and types of training. 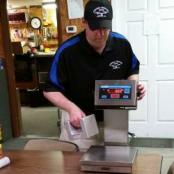 Training classes range from the basics of weighing to high level programming. Of course no amount of classroom work will provide enough learning as good old fashioned real world experience. One of the key areas of training is to learn from experienced technicians which is a strategy we've used for decades. This allows our more experienced technicians to work in the field with our new technicians. This training allows us to mentor our employees on how to handle all situations when in the field. From an installation of a vehicle scale to the troubleshooting of a lab balance, we give employees experience in the field before sending them to a job by themselves. Finally, since technology is constantly changing, we have found it necessary to increase our knowledge at a more rapid pace. This is where online webinars come into play. This is an ongoing initiative that we have adopted utilizing the resources of our key suppliers like Avery Weigh-Tronix, Cardinal Scale, Doran Scales, and Rice Lake Weighing Systems. We have found this to be an effective learning tool for our employees and it is much more convenient and efficient to coordinate. This training will not replace other sources of training but is utilized for knowledge and keeping up with new technology and products.